An amazing, small-footprint machine made by a legendary company in the industry. Recommended for: Anyone, and if the Probatino’s capacity isn’t enough to meet your needs, they make bigger machines that are able to handle any capacity. Are you in the business of selling specialty coffees by the drink? Do you want to start selling your own brand or blend of fresh ground coffee to your customers? Do you live in a large household, filled with power drinkers, and want the ultimate in coffee flavor experience? 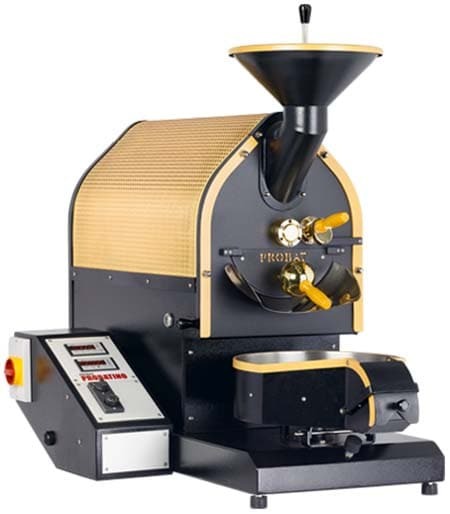 If you answered yes to any of those questions, then you’re going to love our in-depth review of the legendary Probatino commercial roaster. It’s the smallest roaster the company makes, but doesn’t sacrifice a thing in terms of quality or capability, and is an excellent choice for smaller coffee houses or home roasters who plan to roast in bulk for friends and extended family. It’s not cheap, but this is a case of getting what you pay for. Best of all, even if this particular model proves to be too small for your purposes, the company also offers machines that can handle much larger capacity loads. In any case, we’ll cover everything this great little machine can do in the sections that follow, so you’ll have all the information you need to make an informed decision. The first thing you’ll notice about the Probatino roaster is that it’s almost shockingly small, with a footprint measuring just 36.5” x 24” x 45.” At this size, it’s small enough to fit on a sturdy work table or a rolling utility cart if you want to do so, but it weighs in at a hefty 260 pounds, so if you’re planning to place it on either a table or a cart, just be sure it’s sturdy enough to handle the load. The rolling utility cart idea is an excellent one because it would make it relatively easy to relocate the roaster if you need to. As far as aesthetics go, it’s not a particularly attractive machine, but it’s not ugly either. You can tell though, that the designers spent most of their efforts on functionality and performance, and only gave a passing through to aesthetics. That’s not a bad thing, and the machine is attractive enough to make an excellent addition to most any commercial kitchen, it’s just not something that will make people stand up and take particular notice. It’s all business. The Probatino roaster is full-featured and capable, allowing you to control every variable of the roasting process, from the amount of airflow the unit gets, the rotational speed of the drum, and of course, the temperature. Speaking of temperature, the Probat is a ​gas-powered roaster (with either propane or natural gas configurations available), which most serious home and commercial roasters prefer, for the same reason that Master Chefs prefer cooking on gas stoves, rather than electric ones. It just gives you more precise control. Even better, all of the controls are easy-access, thanks to the ergonomic placement of the control panel. It features a solid roasting drum and a custom paddle mixer that ensures optimal blending and an amazingly consistent roast. You’ll also find a conveniently located burner sight glass, a bean sampler, and on the control panel, a digital thermometer for continuous monitoring of the process. The cooling tray has a magnetic catching system that allows for easy tipping and bean dumping. Literally, everything about this machine is designed for ease of use and convenience. As many things as we like about it, the Probat has one shortcoming. There’s no USB port, so there’s no way to connect the machine to a PC to develop roasting profiles. Once you gain hands-on experience using the machine, it’s possible to get a high degree of consistency from one batch to the next, but it will take time and practice. 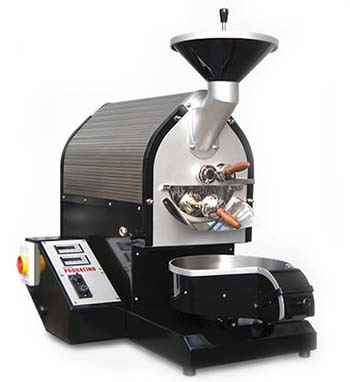 From a capacity standpoint, the roaster can handle batches ranging in size from 1.75-2.2 pounds, with an average roasting time of fifteen minutes. Based on those figures, you can count on being able to do 3-4 batches an hour (note: the darker you roast, the more time each batch will take, which could put you over the fifteen-minute mark). That’s fine for coffee houses that make most of their profits selling specialty coffee drinks by the cup, but if a significant portion of your profit comes from selling specialty blends by the pound, then this roaster is likely to be inadequate for your needs. Again though, the company sells much bigger machines that are capable of handling any volume you can throw at them. There’s not a lot to talk about here. There are no presets, and the controls are all straightforward and intuitive, which gives the machine a very gently sloping learning curve. You can learn the basics of the Probat’s operation in a matter of minutes, although mastering its use will take some time. The key here is to trust your eyes and ears. The unit’s excellent design gives you an easy view of the roasting chamber, so you’ll be able to clearly see the beans as progress through their color change. Just keep a watchful eye out, and listen for the first and second cracks, and you’ll be producing world-class roasts, every single time. These two items are things that most roasters struggle with to one degree or another, which makes the Probatino roaster a pleasant surprise indeed because it handles both items very well. 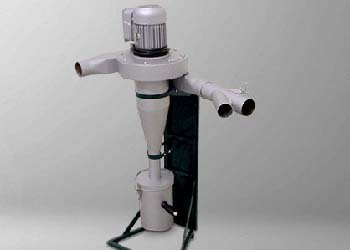 The exhaust system is well-designed and powerful, and chaff management is excellent thanks to a separate cyclone that helps separate your roasted beans from the unwanted chaff particles. In our book, it’s this kind of excellence in design, engineering, and manufacture that more than makes up for the lack of USB support. It’s just a great machine, from top to bottom. The best comparison we can give when it comes to learning to use the Legendary Probat commercial roaster is chess. Owing to the unit’s exceptional design, learning the basics will only take you a matter of minutes. True mastery, however, will take a considerable amount of time. You’ve got to learn how responsive the controls are, what settings produce the results you’re looking for, and when to stop the process, with the understanding that the roast will continue for a brief period after you kill the heat and transfer the beans to the cooling tray. Where keeping the unit clean is concerned, once again, we have to give the manufacturer high marks for their design excellence. Everything is easy to get to thanks to conveniently located maintenance ports and doors. A good rule of thumb is to give the roaster a thorough cleaning after about every five roasts, but the darker you prefer to roast, the more often you’ll find yourself having to stop production for a cleaning. At the end of the day then, just let your eyes be your guide and clean as needed. Price – The Probat is one of the more expensive roasters in its class, and you can get a gas-powered roaster with more capacity for less money. On the flip side though, these machines are designed to give decades of reliable service, and the manufacturer’s post-sales support is world-class. Again, it’s a matter of getting what you pay for and what your priorities are. Lack of USB Support – If you’re old school and like roasting purely by hand, without the aid of fancy roasting profiles, then this won’t bother you a bit. If you prefer some high-tech guidance and wizardry, however, this machine will leave you wanting. 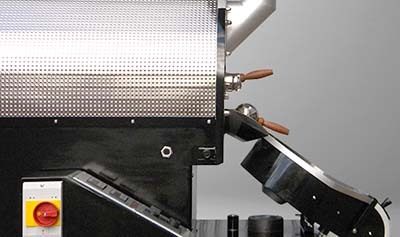 (Relatively) low capacity – As mentioned earlier, you can easily find roasters that offer significantly more capacity for less money, and if capacity is a big issue for you, then it’s entirely possible that the Probat will come up short. Bear in mind, however, that the manufacturer makes roasters with significantly higher capacity limits, so if that’s the deal breaker for you, you owe it to yourself to check out some of their other models. 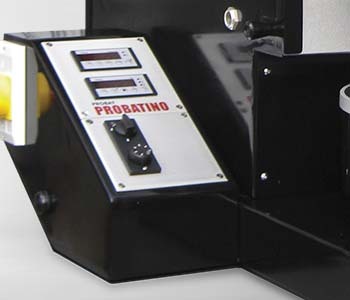 No matter how you slice it, the legendary Probatino commercial roaster is an impressive machine, offering incredible convenience and ease of use in a relatively small footprint. Not only that, but you get the company’s legendary reputation for quality and support. 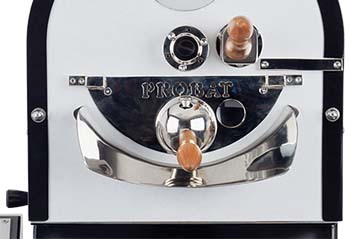 Sure, it’s one of the more expensive models on offer in its class, but given the quality and longevity of these machines, we regard that as being a premium well worth paying, and recommend the Probat without hesitation, to anyone. Coffee Roasting Basics: Developing Flavour by Roasting. Barista Institute. Let's Talk About Roasting. Barista Hustle. Roast Profile & Degrees of Roast. Beans.